- When do I perform? Choral singing refers to a group of singers performing together under the guidance of a conductor or choir master. Choirs may sing without instrumental accompaniment, with the accompaniment of a piano or other instruments, and in recent years even backing tracks. While junior choirs mostly consists of soprano and alto voices only, senior choirs consist of four sections (soprano, alto, tenor and bass voices) intended to sing in four part harmony. The number of possible parts is finally determined by the skills level of the choir members. A choir is a group of singers that usually comprises of different voice types (soprano, alto, tenor and bass or SATB in short). Primary school choirs however, will mostly only have soprano and alto voices that includes boys and girls. Choral music refers to the music written or arranged specifically for such an ensemble to perform. Choirs may perform music from the classical music repertoire, which spans from the Medieval era to the present, or even popular music repertoire. Most choirs are led by a conductor or choirmaster, who leads the performances with arm and face gestures. Choirs may sing without instrumental accompaniment, with the accompaniment of a piano or other instruments, and even backing tracks (refer to the Classical Crossover section in this regard. Choral music are mostly written in four part harmony, but there is no limit to the number of possible parts. Junior and inexperienced choirs often sing in unison. Various compositions / arrangements are available that also provide for 2-part and 3 part singing, over and above the usual 4-part harmony. For secondary schools the use of 3-part singing comprising of soprano, alto and bass are very useful (in this scenario the inexperienced male voices can join forces by singing in one part only). It is of great importance to note that choral singing in general is characterized by a very specific style and tonal quality. Uniformity in the production of vowels and the articulation of consonants, etc. Classical music:This refers to all choral works composed or arranged in “classical style”. 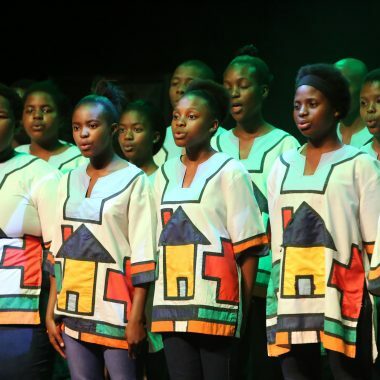 Classical Crossover music:Teacher, trainers and participants should take careful note of the definition of Classical Crossover Music as applicable to this Prospectus of the National Eisteddfod of South Africa®. Contemporary Choir music:In this context “contemporary choir music” refers to arrangements for choir of “popular” contemporary music, e.g. the music of ABBA, Queen, etc. Various arrangement, even with backing tracks are available for this purpose. There are no specific prescribed pieces in this category for choirs. All items are own choice. CONCERT PROGRAMME PERFORMANCES: the number of songs is limited to THREE. PERFORMANCES OF SINGLE WORKS /SONGS: only ONE song per item. Senior choirs are encouraged to perform at least one song a cappella (unaccompanied). Time limit: Competitors should not exceed the time limit. A choral work may not be presented in more than one section. Although junior primary school choirs normally sing in unison, they are encouraged to include part-singing. Senior primary school choirs are expected to sing in two – or more parts. A choir should have at least 20 members (smaller groups should enter the vocal section). Copies of the choir programme must be submitted to the adjudicator prior to the performance. No copies of music for the traditional section are required. KINDLY NOTE: Backing tracks may only be used in the “CLASSICAL CROSSOVER” Section. It is the responsibility of the participant/teacher to select and provide the correct entry number on the entry form. The National Eisteddfod Academy accepts no responsibility if the choir was entered incorrectly. It is of particular importance to note the difference between items that need to be performed with live accompaniment (acoustical) and those items that will require backing tracks. Instruments will not necessarily be available at venues where items which require backing tracks have been scheduled. Likewise will items which require live accompaniment be scheduled at venues suitable for that purpose only. Once the entries have been scheduled, any changes to incorrect entries will be subjected to the payment of a penalty fee of 00 per incorrect entry. Live Accompaniment refers to the accompaniment of a vocal or instrumental performance on an acoustical instrument (i.e. a musical instrument that is not necessarily electronically amplified). Arrangements for accompanists should be made well in advance. Any choir without access to a piano or accompanist can contact the NEA office for contact details in this regard. Any performance should stay within the prescribed timeframe. The NEA does not disqualify participants, but exceeding the allocated time limit could result in the termination of a performance. Any questions regarding the music category could be e-mailed to info@eisteddfod.co.za.